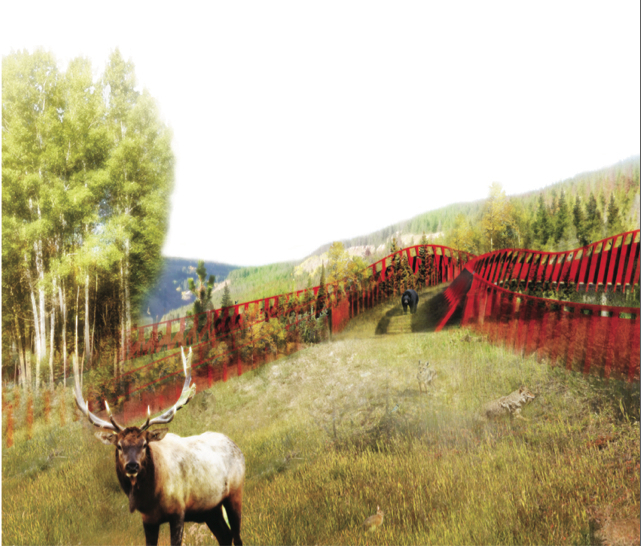 The winning wildlife-crossing design distills multiple habitat types from the surrounding landscape into parallel bands that act as corridors for various animal species. Wide bands provide an open field of view, while narrow forest and shrub bands provide enclosed corridors. The HNTB and Michael Van Valkenburgh Associates design uses pre-cast modular vaults for ease of construction. 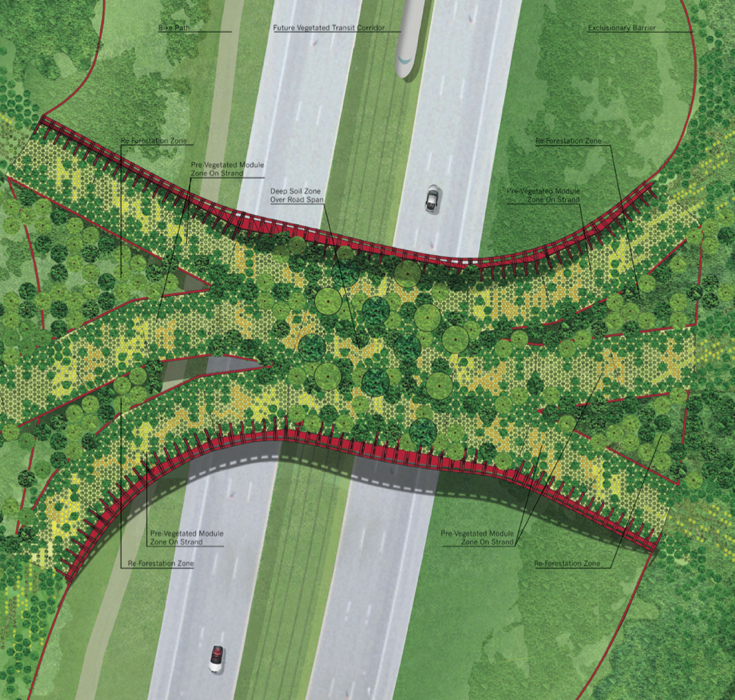 This design from the Olin Studio uses preplanted modules to add vegetation to the crossing. A design from Zwarts & Jansma Architects emphasizes curves as a design principle. 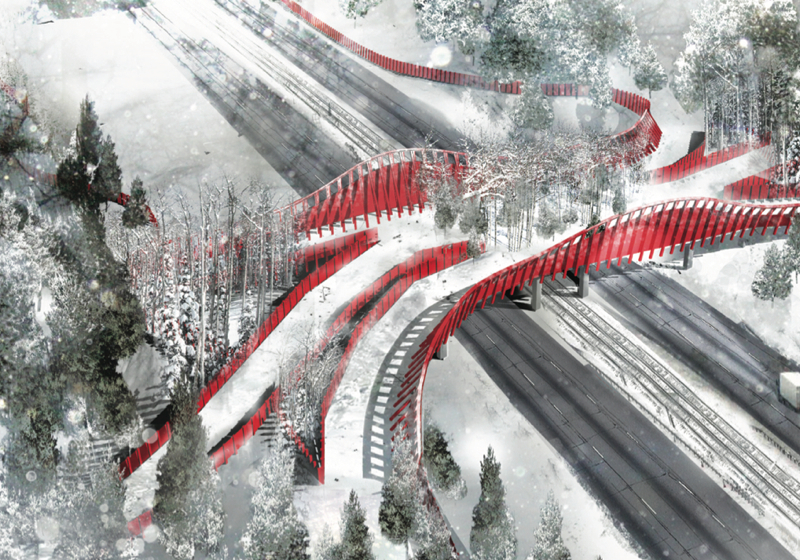 This design from Balmori Associates shows their plan for a timbered overpass. See the photo gallery above for images of all the finalists from the competition. 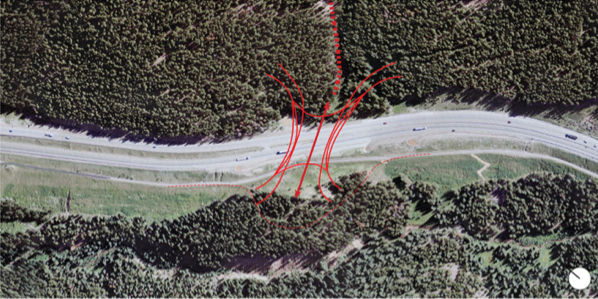 In the Rocky Mountains of Colorado, Interstate 70 cuts from east to west across what wildlife biologists call the Mountain Corridor—a 144-mile-wide swath of mixed habitat flowing north and south between Denver and Glenwood Springs. The corridor is a major throughway for mountain goats, bear, Canada lynx, moose, deer, fox, and other animals roaming in search of food and mates. As traffic on the highway has increased and regional development has claimed more habitat, more animals have died in collisions with vehicles. Designs arrived from 36 teams in nine countries, representing more than 100 firms. Chairing the five-member international jury that reviewed the five finalists was Charles Waldheim, Irving professor of landscape architecture, chair of that department at the Graduate School of Design (GSD), and a leader in the emerging field of landscape urbanism. “Wildlife crossings, which are common in Europe, are a long-overdue response to the ecological damage the…interstate highway and civil defense systems have done in this country,” he says. Cities, he notes, began to redress the social costs of routing highways through neighborhoods decades ago, but the public has yet to stem the destruction of wildlife habitat and populations by highways in more remote areas. 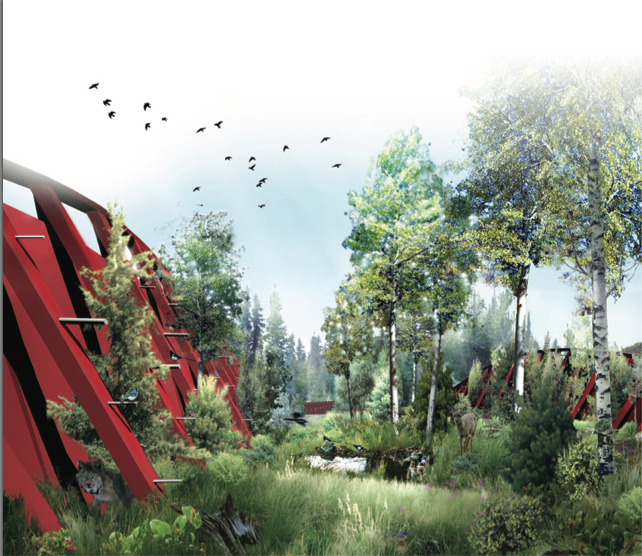 In January, the jury unanimously chose a design called hypar–nature, submitted by HNTB Engineering, of New York City, teamed with Michael Van Valkenburgh Associates (MVVA), a landscape architecture firm founded by the GSD’s Eliot professor in practice in the department of landscape architecture, with input from ecology consultants Applied Ecological Services. The winning design takes its name from its lightweight, super-strong “hypar (hyperbolic parabaloid) vaults”—V-shaped concrete ribs, bent obliquely and pinched at each end—that span the highway. 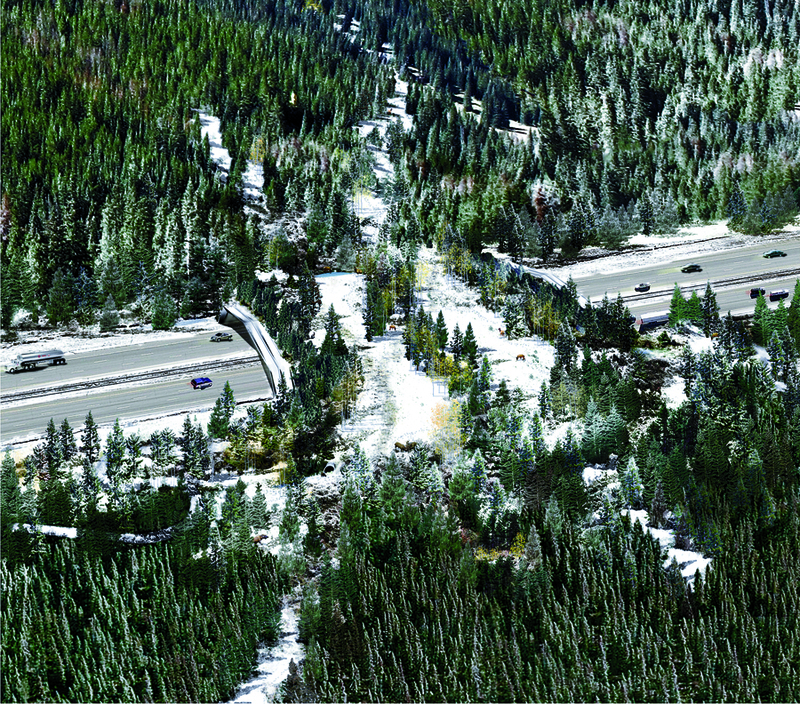 “A wildlife crossing must support loads five times greater than conventional bridges, due to the combination of soils needed to support landscape, plus an allowance for snow and robust landscape growth over time,” explains Ted Zoli, an HNTB vice president who is an expert on bridges. The hypar vaults are an adaptation of the common pre-cast concrete beam, he explains: “Each vault serves as abutment, pier, beam, and slab, all in a single, repetitive element.” The team designed the low-cost, modular structure as a prototype that can be easily modified and replicated in a regional network. 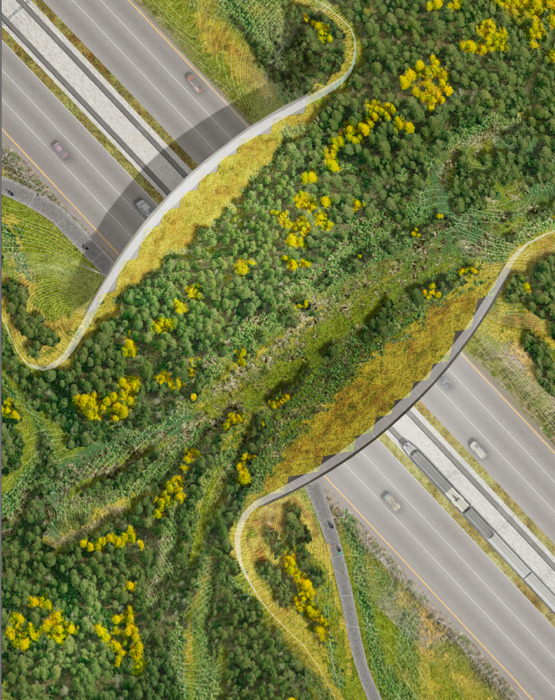 The design does more than simply knit together the natural landscape on both sides of the highway to facilitate wildlife crossing passively. 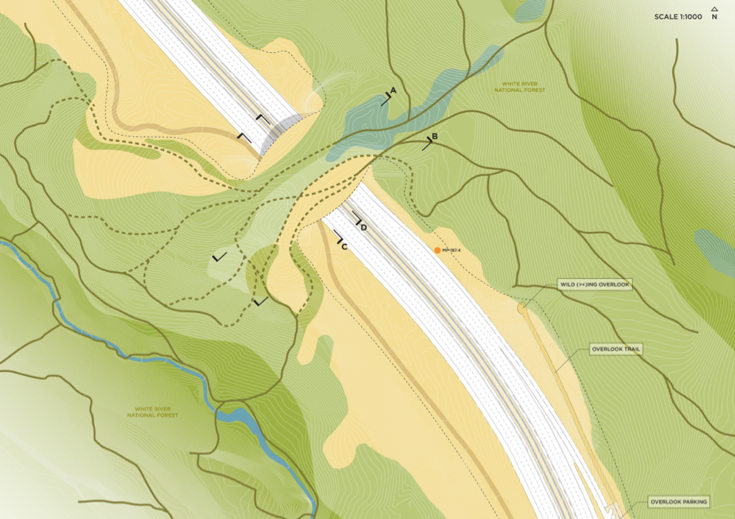 It also distills and intensifies the four main types of surrounding habitat—scree, forest, shrub, and meadow—into discrete corridors that induce animals to cross by providing protective tree cover, areas with open sightlines, and thick plantings of favorite food sources (grasses, sedges, and fruiting shrubs) that extend across the bridge. To keep creatures from straying over the sides, an exposed hypar vault borders each side of the landscape, creating a V-shaped concrete barrier eight feet deep with a 60-degree slope.